All that separates them is a few thousand years. The slow advance of progress sometimes needs a little prod to keep things moving in the right direction. And, of course, occasionally it needs to feel the fine point of the spear to keep marching. For what they call “civilization,” there still is quite a lot of war to forge it–and to keep it. For every peaceful revolution, there are three that require guns and steel. 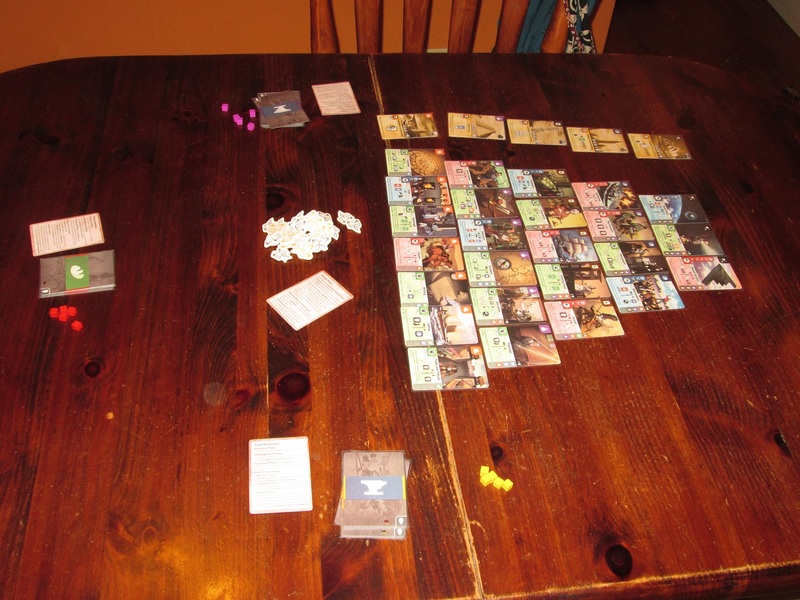 Guns & Steel: Renaissance set up for three players. 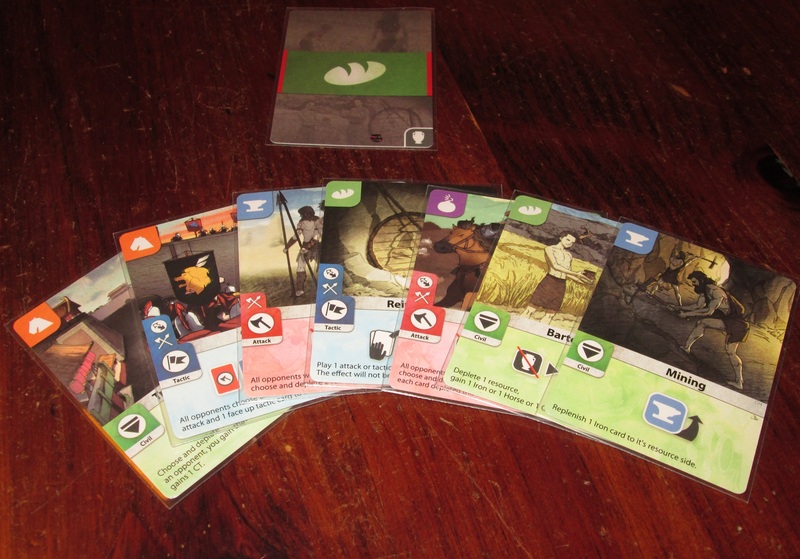 To begin, players receive the cards and glory markers of one color. 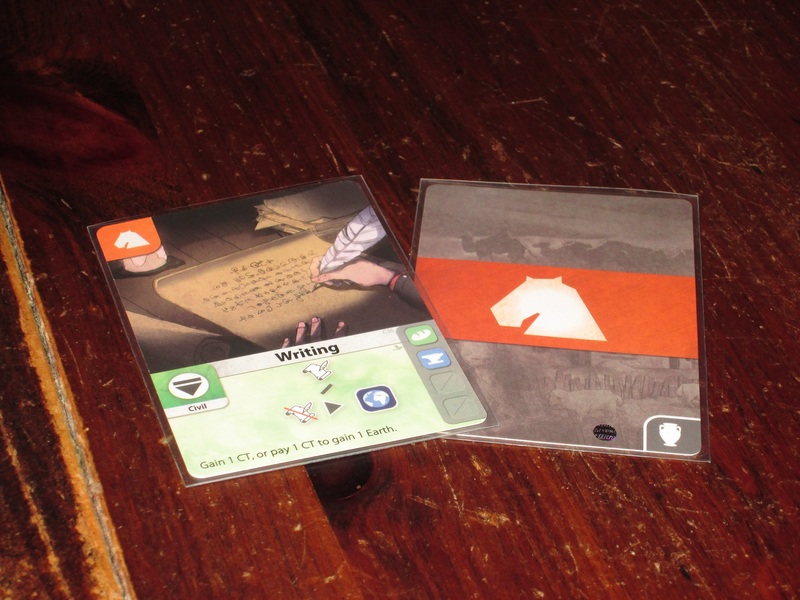 The card pyramid is set up with horse resource cards on the bottom, followed by gunpowder, oil, earth, and space. One wonder card is set out per age (based on the location of cards in the pyramid), and the culture tokens are set out as a supply. Cards in Guns & Steel are double-sided: one side shows a resource type, and one side shows an illustration and card ability (a development). 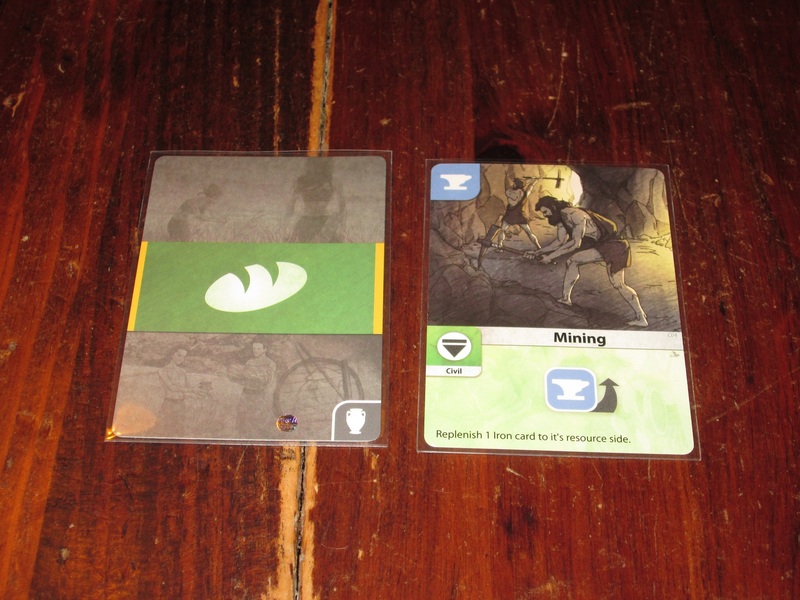 Each card is double-sided: one side showing just a resource, the other side showing a unique development. On a turn, players must play one card face down in their tableau as a resource and one card face up as a development. Then they may activate the development for the effect and may purchase a card from the pyramid. Cards on the bottom of the pyramid are always the cost listed on the card. Cards higher up in the pyramid are the listed cost plus one resource of any kind for any connected cards below them in the pyramid. Players may convert resources into other kinds of resources if they want to, and any resources used are depleted (the resource cards are turned to their text side). Purchased cards go face-up into their tableau. A sample turn. Each turn players must play one card face down as a resource and one card face up as a development. If after purchasing a card (or not) the active player has zero or one cards in hand, that player retrieves all face-up cards back to their hand. (Cards on their resource side can stay out.) Then the active player may place a glory token on one wonder for which the condition was fulfilled (e.g., playing a resource of a certain kind, not buying a card.) If a player ever reaches the number of glory shown on the card, that player claims the wonder as end-game points. The game ends whenever either all of the space cards have been purchased, all of the wonders have been claimed, or a player has 15 points in culture tokens. 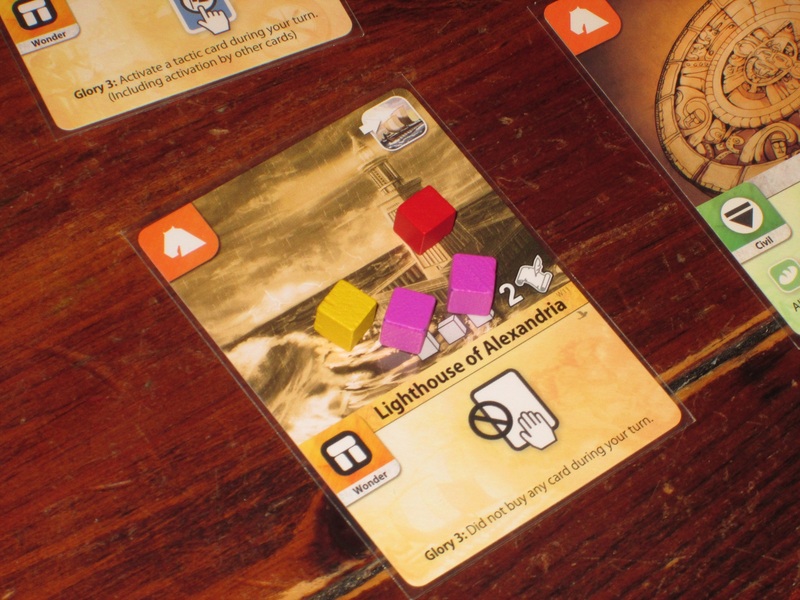 Players add up culture points on their cards, wonders, and tokens, and the player with the most culture wins. When Through the Ages was released in 2006, much ado was made that it was a civilization game that used cards but no map. Since then there have been several other card-based, mapless civilization games to follow in its footsteps–with 7 Wonders and Innovation being perhaps the most well known–and Guns & Steel: Renaissance is the latest in this line. 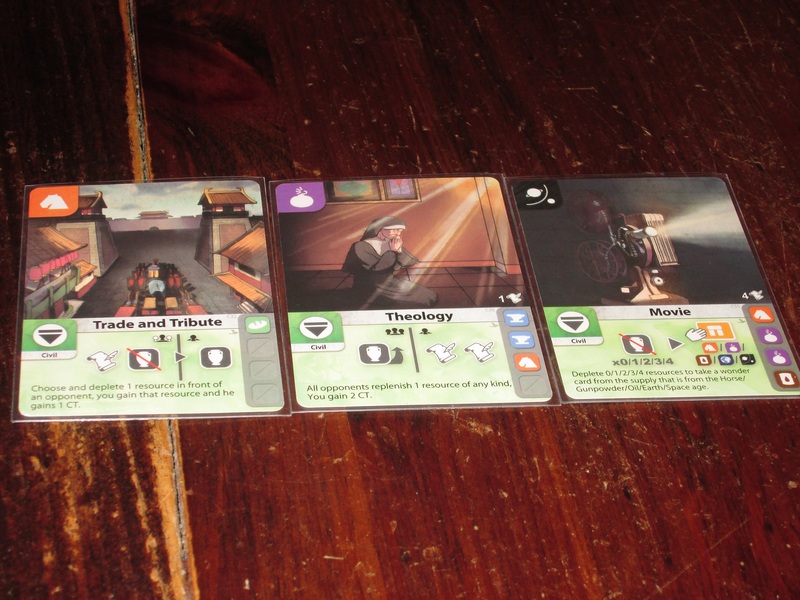 But while Through the Ages uses a heavy resource-management system and 7 Wonders uses simultaneous drafting and Innovation uses…Chudykian mechanisms to achieve their take on civilization building, Guns & Steel: Renaissance employs a simple system of hand building and management. In this way it feels quite different from its predecessors and provides a unique twist on the genre. The card pyramid. 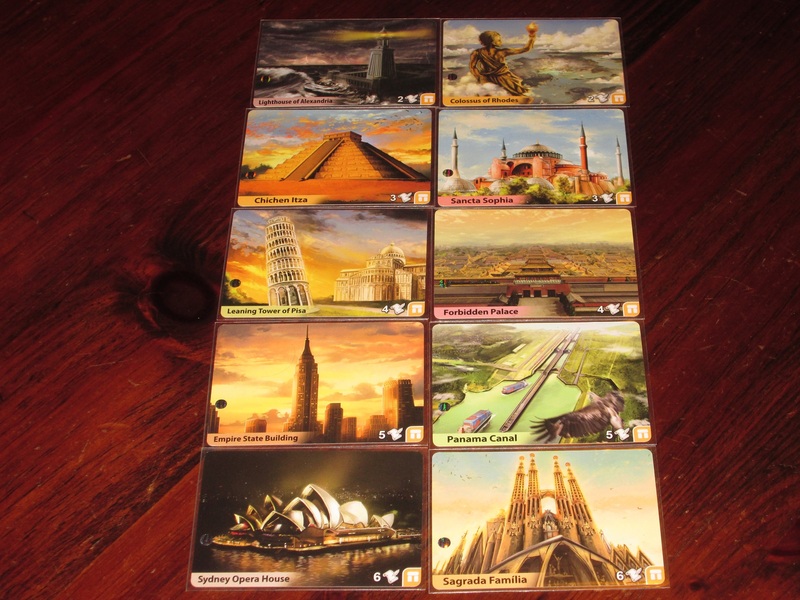 It IS possible to have a civilization game in just cards and a few tokens. Guns & Steel: Renaissance is a stand-alone game that also expands Guns & Steel. I haven’t played the original Guns & Steel, but Renaissance is a tense and fun game in its own right, one that offers interesting decisions, grueling trade-offs, and a decently weighty play experience with a small physical and time-investment footprint. 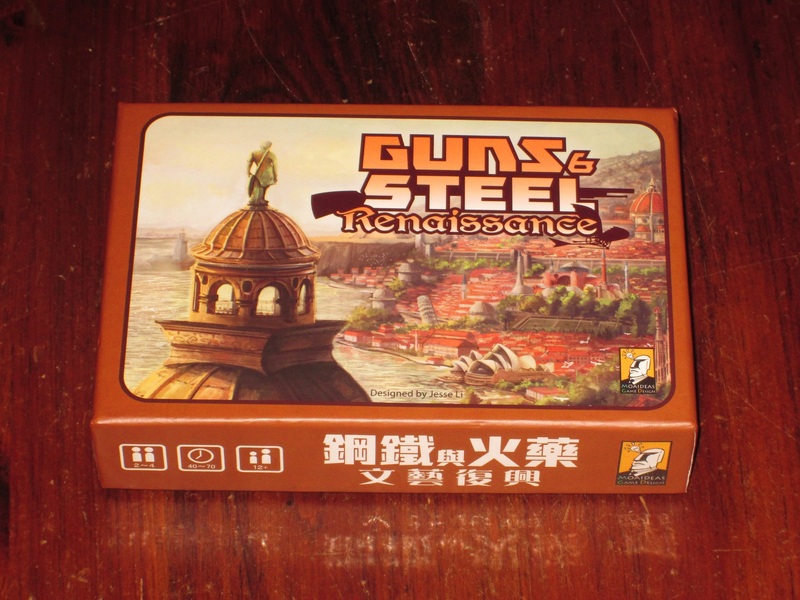 The rules are simple to grasp, and there are few components to familiarize yourself with (although each civilization card is unique), so while a game of Through the Ages might take you an afternoon, Guns & Steel: Renaissance plays comfortably within a lunch hour. Civil achievements through the ages. Guns & Steel has an interesting ebb and flow that makes it distinct from other civilization-building games (and even just other games) I’ve played. Because cards can be played to the table and retrieved, it’s possible (however unlikely) to earn points with military without amassing an army. As cards are taken back into the hand, the state of other players’ militaries changes. Opponents can play response cards that might add more military to their tableau, but it’s possible for the military underdog to achieve victory now and then just based on the flow of the game. I like this. For one thing, it seems truer to history (the strongest does not always win). It also makes the game more fun for players who are not dominant in the military sphere. But Guns & Steel does encourage players to participate in the arms race. (Take the title seriously.) Military cards come in two varieties: a kind that forces players with less military to deplete resources, and a kind that gives players with at least as much military as the player culture tokens. In either case, it’s better to be on the cutting edge of military ingenuity, so the tactic and military cards are often sought-after commodities in the card pyramid. 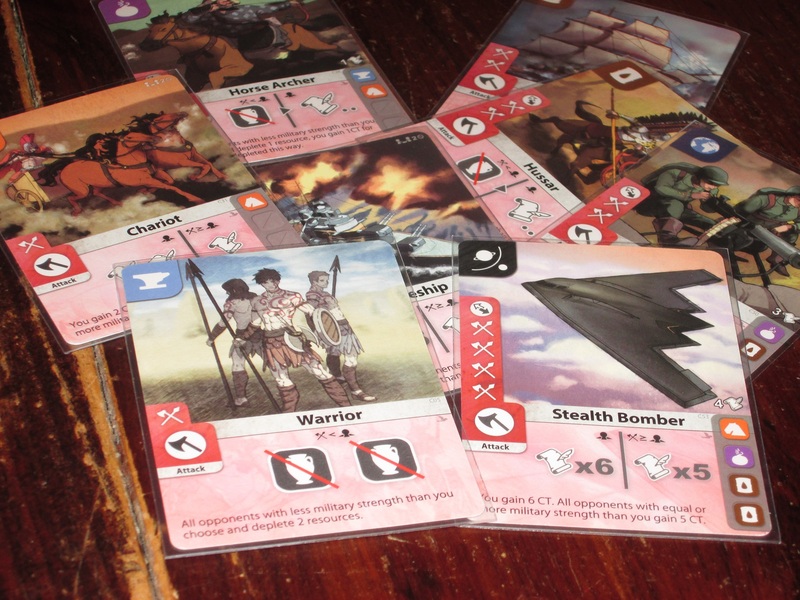 Tactic and military cards also give players flexibility: whereas a civil-card-heavy strategy means slowly churning through your entire hand before being able to retrieve, because of the response icon on tactic and military cards, it’s possible to play these cards from your hand, thus speeding up the player’s tempo (at the cost of not being able to activate those cards). The starting hand in Guns & Steel: Renaissance. From these humble beginnings, you will forge a civilization worth remembering. This illustrates one of the things I love about the game: trade-offs. 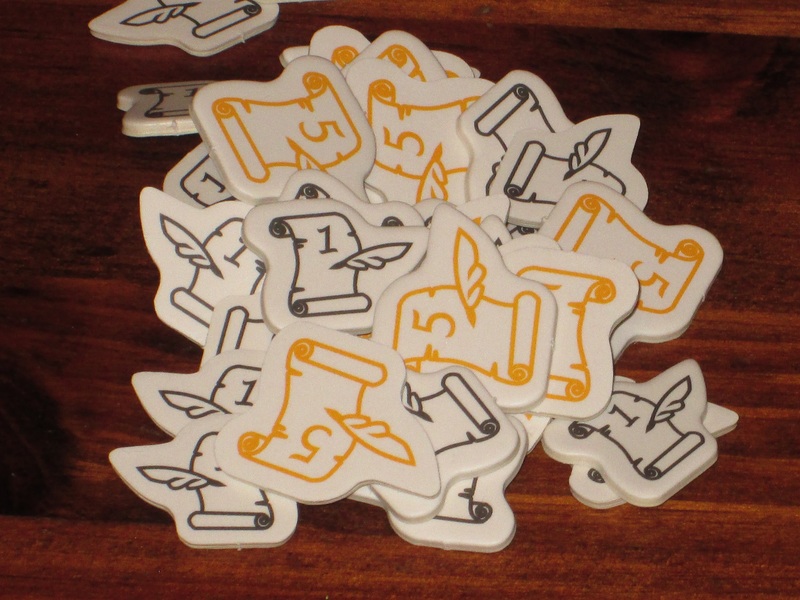 Each card can be used as a resource or development, and you really want your cards to serve double duty. The better the resource on the back, the more powerful the ability on the front, but you can’t have it both ways. In order to buy the higher-point-value (and more powerful) cards, you need resources; in order to gain culture tokens during the game, you need to utilize the card abilities. So it is an interesting puzzle trying to find the right balance between which resources to play and which abilities to activate–and in which order. Because many of the cards benefit or harm other players based on what they’ve played to their tableau, a card that should not be played in one round can be a golden opportunity in another. In this way, the game is highly interactive, as it’s necessary to see what others play and to know what they hold in their hands. There’s no single lever that can be pulled again and again because players must play a resource every turn, and they will likely want to use even their best cards as resources occasionally to unlock the best cards in the pyramid. 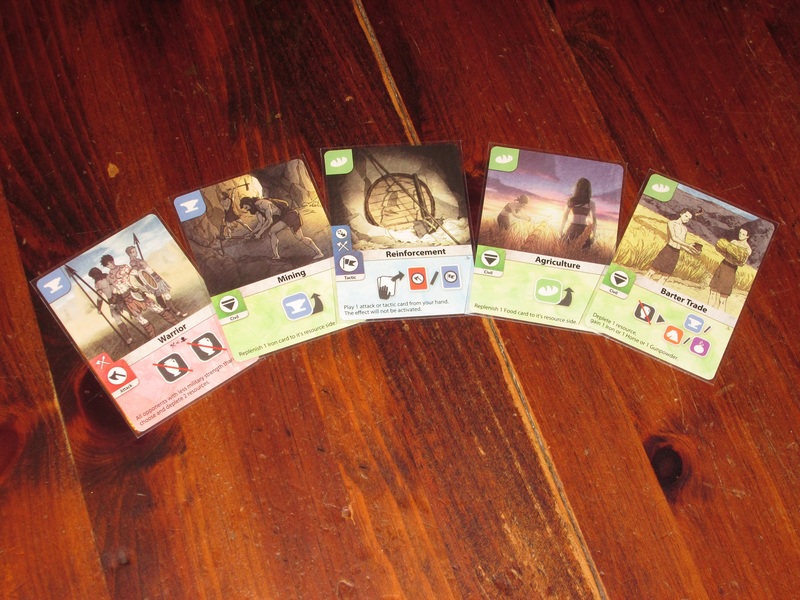 Culture tokens are one stream of points that players can earn during the game. There are also multiple point streams in Guns & Steel. Players are likely to need to compete in all of them to have a shot at victory, but there’s no silver bullet. Civil cards and military cards often give players culture tokens during the game, but these opportunities are situational, and players have to be careful as they often open opportunities to other players. Each card purchased after the first age is worth end-game points, so players can use a card-heavy strategy to get points (at the expense of being slower to churn through their hands). And wonders offer another stream of points, but gaining these can be competitive, and it’s hard to work toward more than one wonder at a time. Even in earning points, players have to experiment with different routes and choose a method of scoring points that works for them. Purple is very close to claiming this wonder. It might be worth redirecting your efforts elsewhere if you can. 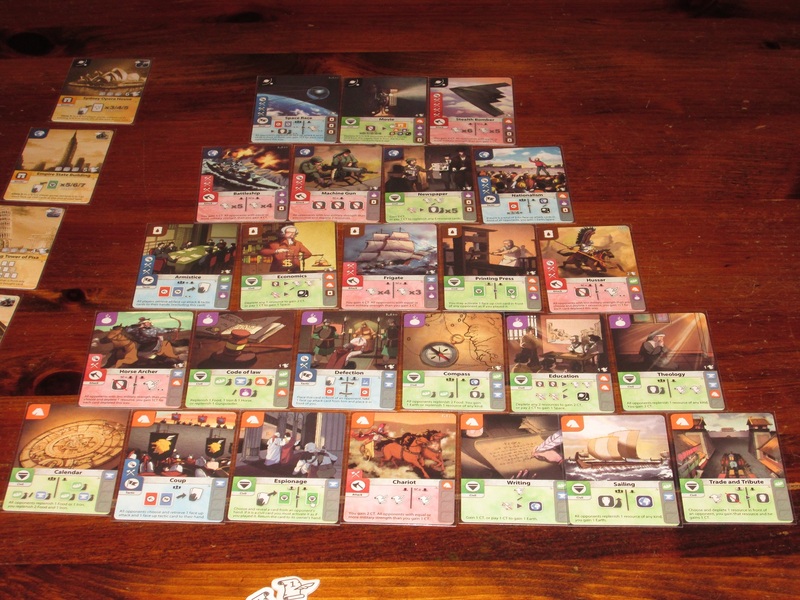 When I’ve taught Guns & Steel, I’ve likened it to Concordia, another hand-building game. The two are very different in how they play out, but the hand-building in both emphasizes the importance of pacing: if you use all your best cards early, your good options will dwindle, and you might have to play suboptimally. In Concordia, you can use any turn to retrieve your hand and start the process again. Guns & Steel is less forgiving in this respect: until you have one or zero cards in hand, you are stuck with playing two cards per turn until you run out. The fun thing here, though, is there are ways to control the pacing, either through leaving resources leftover when it’s time to retrieve (meaning you retrieve fewer cards) or by purchasing cards with a response icon, which can be played outside the two-cards-per-turn format. 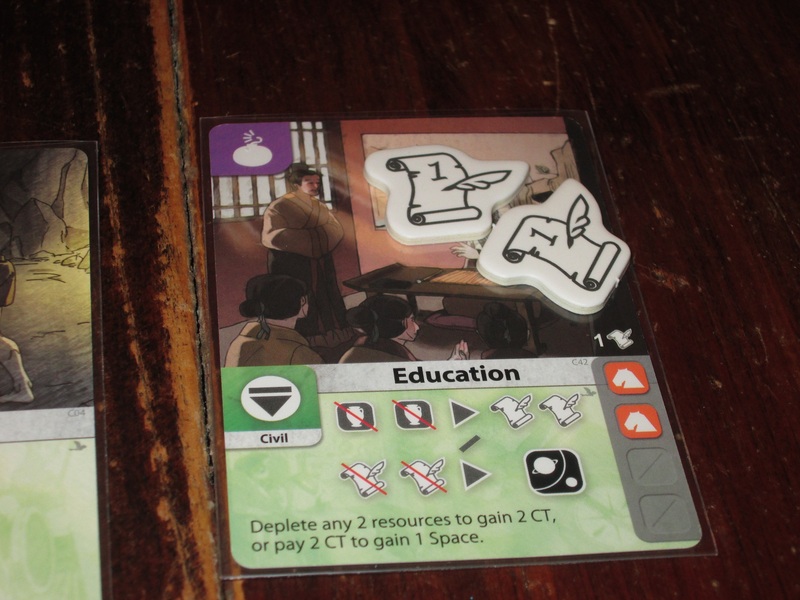 Many civil cards–like education–generate culture if they are played as developments. Guns & Steel is truly fascinating, and it feels novel. 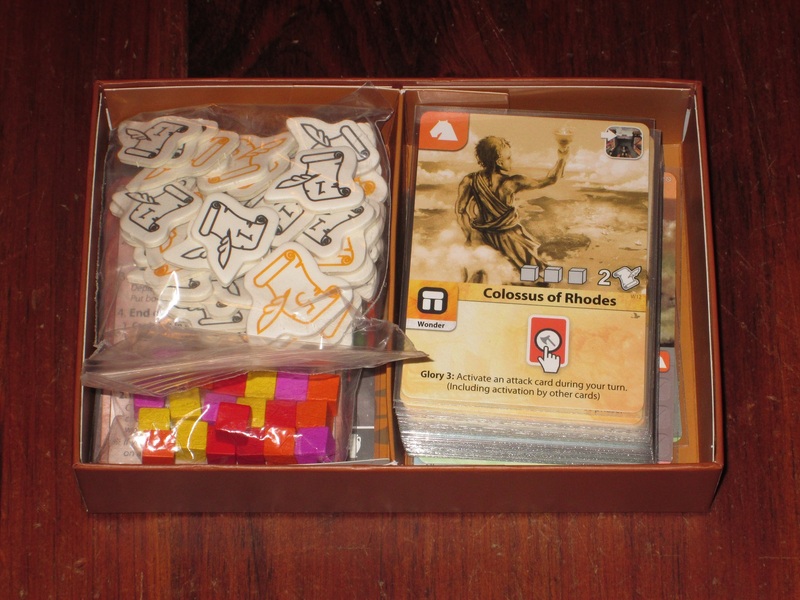 It’s a bonus that the box is small (about the size of that other civilization card game, Innovation), and the gameplay is clever like other multiuse card games (particularly those of Carl Chudyk). I like the art in the game, and while it would be easier to keep track of other players’ tableaus if some of the icons on the cards were bigger, it’s not too much of an issue in actual play. Many wonders are available for claiming. One side of the cards shows the gorgeous art here (the other side shows how they are claimed, each via a different condition). I think Guns & Steel: Renaissance is a great game, but there are a few caveats that keep it from a universal recommendation. First, the sheer number of options can induce Analysis Paralysis, and this only gets worse as the game progresses. All of the cards are out on the table at the start of the game, so if you try to chart a course early on, you can get lost. Similarly, you have to play one card as a resource each round and one card as a development, and as the game goes on and your hand gets larger, the decision of what to play can take longer because each decision is also more important. So players who are prone to AP may have some difficulties (and cause downtime problems for others). This should let up as you learn the cards, as the same cards are used in every game, and many of the abilities are more or less similar to each other (they just vary in strength). My hand after just two retrievals. 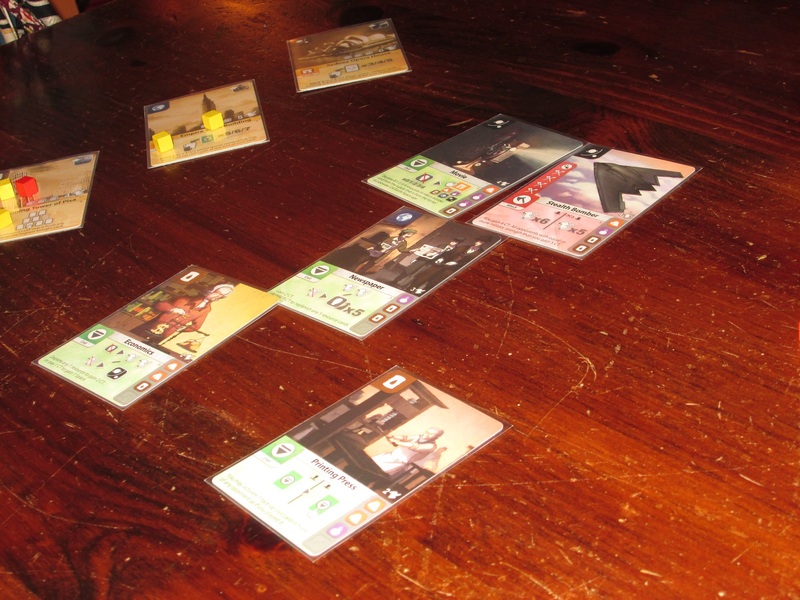 The game ramps up quickly, and players gain new options at breakneck speed. What may be more of a problem is the combative nature of the game. The title of the game is Guns & Steel, and it certainly delivers on this promise. Military cards are prevalent and an important part of the game. Unlike Dominion, attacks in Guns & Steel affect players disproportionately, and it’s easy to see who is likely to be more adversely affected than the others. Still, even though military is an important part of the game (and I doubt it’s possible to win without it, at least if someone else is buying these cards), there are other avenues for victory as long as you maintain a healthy arms race. The conflict here is far from take-that, so likely only the most conflict averse players will have any problems here. I typically like heavy interaction in games but not direct conflict (think classic Euros like El Grande), so for me, the conflict in Guns & Steel isn’t much of an issue. Options for cards to purchase dwindle as the game goes on. This, of course, makes cards cheaper and cheaper. So much game is packed into such a small box. I love this about Guns & Steel. And I will probably want to, because Guns & Steel: Renaissance is a fascinating game that uses minimal components to encourage big decisions. The hand management is grueling, the hand building is novel, and the multiuse cards ensure that players will never get all of what they want. There are subtle strategies and tactics that players won’t discover on their first play, which makes for a game that, even though the components are static, opens up in dynamic options each time you play. Guns & Steel is the kind of game that encourages going deeper, so you’ll want to have a group you can play it with over and over again. If you can manage that, and you like this sort of fascinating card game, you’ll want to add this one to your collection. iSlaytheDragon would like to thank Moaideas for providing us with a copy of Guns & Steel: Renaissance for review.